Last weekend I enjoyed re-reading Positively 4th Street: The Lives and Times of Joan Baez, Bob Dylan, Mimi Baez Farina, and Richard Farina. Author David Hajdu takes readers back to the 1960's Greenwich Village folk scene, where these rising folk singers met, sang, wrote, fought, fell in love, and lived. My online book group, Curl Up and Read, is discussing Positively 4th Street this week. I read the book when it first came out, and enjoyed experiencing it again. I love books that take the reader to another time and place, as this nonfiction book does. Readers will meet sisters Joan and Mimi Baez. They developed an interest in folk music early and often sang together as young girls. Joan, who was older, made a splash in the early folk music scene with her beautiful, soaring voice. Mimi, who was younger, was a very pretty girl with a strong presence; several of Joan's boyfriends fell in love with her. Joan met the younger "vagabond" Bob Dylan, and they developed a complex romantic relationship that lasted, off and on, for several years. Dylan is not portrayed very sympathetically in this book. He is seen as a brilliant writer but a difficult personality. 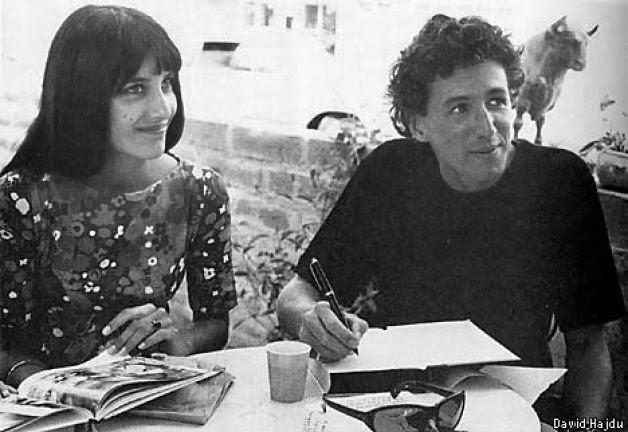 As Joan Baez got more involved in the peace movement, Bob Dylan became interested in growing as a musician and becoming a rock singer. His first live electric set was met with boos during the Newport Folk Festival of 1965. Richard Farina, former college roommate of Thomas Pynchon, wrote a novel that would become a contemporary classic, Been Down So Long It Looks Like Up to Me. Mimi worked very much as a helpmate to him and she also focused on their music career, mastering several instruments. Richard died tragically on Mimi's 21st birthday, when he was killed driving a friend's motorcycle. We bring our own experiences to some books more than others. This is one of those books for me. I was born in the 1960's and as a little girl experienced folk music just as something my father sometimes listened to. I really only sought out folk music in the early 2000's, after I originally read this book. I love Joan's voice, Dylan's songwriting, and especially love the beautiful sound of Richard and Mimi's voices blending together. I have always loved Joan Baez's beautiful song about her relationship with Bob Dylan, "Diamonds and Rust." Some time ago, I dated a man who was a sort of Dylan type and I know that this made me a bit impatient with Bob Dylan as we meet him in this book. I have recommended this book to many friends, and I would love to hear from you in the comments (below) if you read it. In researching this book, I found some interesting videos that I think you might enjoy as well. This longer video (9 minutes) features Bob Dylan and Joan Baez singing at the March on Washington, 1963. Richard and Mimi Farina perform "Bold Marauder" on Rainbow Quest hosted by Pete Seeger. This was originally broadcast on February 26, 1966 about two months before Richard's tragic death. Joan Baez's "Diamonds and Rust," with lyrics and photos of her life with Bob Dylan. I was not able to find discussion questions for the book online, so I made a list of 10 questions for our book group. I am sharing them here, in case you are interested in a group discussion of this book as well. 1. What do you think of the title of this book? Do you think the song "Positively 4th Street" (lyrics here) suited the book? 2. How familiar were you with folk music and Baez, Dylan, and the Farinas before reading this book? Will you seek out more of their music now? 3. Which singer stands out most for you? Which is most sympathetic? 4. What was your opinion of the characters? Did your opinion change during your read? 5. David Kelly wrote in The New York Times (1/6/10): "You know the story: Bob uses the enormously popular Joan so he can enhance his career prospects, while Joan uses the enormously gifted Bob so she can sing songs that weren't written by Public Domain; Richard uses Mimi and her family connections so he can become a folk star, while Mimi uses Richard so she can escape her family connections." Do you agree with this conjecture? Why or why not? 6. Why did Bob Dylan and Richard Farina both fancifully reinvent themselves, with elaborate stories about their histories? 7. Joan Baez and Bob Dylan performed at the 1963 rally for freedom march in Washington, D.C. Hajdu writes, "Were they taking advantage of the movement? Or was the movement taking advantage of them?" (p. 183). What do you think? 8. In 1965 Dylan went electric at the Newport Folk Fest. Why do you think he moved away from the folk music movement? And why did he choose the folk fest as a venue to unveil his new sound? 9. If Richard Farina had lived, what do you think would have happened with his career, and with his relationship with Mimi? 10. Would you recommend this book to a friend? Why or why not?